We’re in the midst of a developer resurgence regarding something virtually all Mac users have a use for at one level or another: image editors. In years past, there was Photoshop, and then there was Photoshop. Now, we have a full spectrum of image editors to choose from. High end editors like Photoshop, mid-range wares such as Photoshop Elements and GIMP, as well as some newer, more affordable applications that have pro-style features, but are designed for people with less-demanding editing needs. Acorn offers basic drawing, painting and text tools, layer support and enough filters to keep the average user happy. Simplicity is Acorn’s primary selling point, and Gus Mueller, the mind behind Acorn, has accomplished that goal perfectly. I didn’t really take to Acorn’s straightforward approach at first, but once I gave in to it, the program quickly grew on me. For quick resizing, color adjustments and adding text to images, you really can’t beat Acorn. The single-palette approach makes for speedy and smooth operations, as long as your image isn’t too terribly large, which was the only time Acorn really gave me problems. When working with images larger than 50MB, Acorn became practically unusable on my Mac Pro with 3GB of RAM, but Acorn’s target user probably doesn’t work with images that size, so this most likely will not be an issue. Another of Acorn’s selling points is that it uses Apple’s Core Image technology, which makes greater use of the video card than the CPU to do a lot of the graphics calculations. The great thing about this is that it makes it easy for smart developers to leverage Apple’s technology without having to reinvent the image-editing wheel. Unfortunately, it also means that you’re at the mercy of Apple’s technology and your graphics card’s processor, which isn’t always a good thing. Acorn works with basic image formats—JPG, GIF, PDF, TIF and PNG—and, although it will open Photoshop files, it can’t currently open RAW image files from your digital camera, which means you’ll need to get those files into a readable format before you can use Acorn with them. Acorn is priced quite reasonably at $40, but the Web site states that is an “introductory price.” If they wish to actually make money selling the program, they might want to consider making that the everyday price as well: any more puts it in the “yeah, right” category, in my opinion. All that said, I do recommend you download the demo and give it a try. For the budget-conscious user, or anyone who simply doesn’t need the power of Photoshop, Acorn is quite a nice editor, especially as a complement to a program like iPhoto. Pixel has obviously been developed with the advanced user in mind. 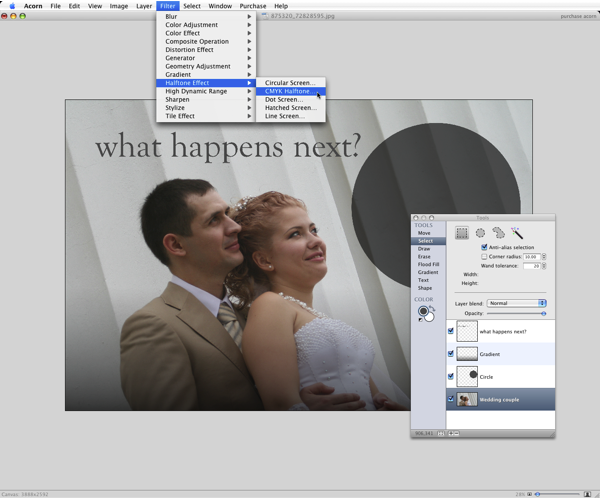 It offers a ton of options and features, above and beyond the normal set of filters, layers and brushes. It will open and export a slew of formats (not RAW, however) and it appears to have virtually every feature you could possibly want, or at least tries to. 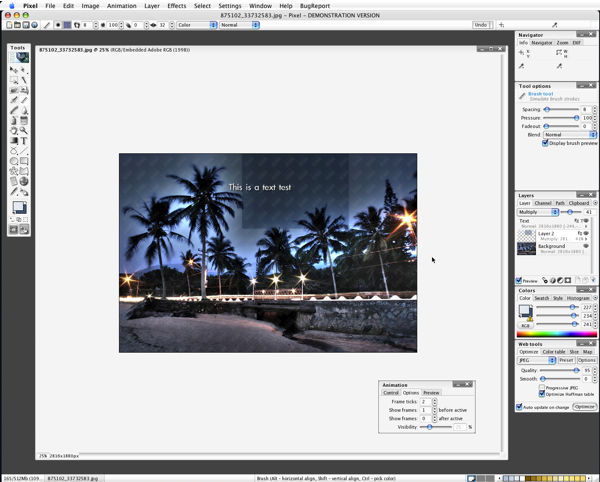 If I had to compare Pixel to anything, it would be Photoshop Elements on steroids, without the user-friendliness. Maybe for those users who come from the Windows or Unix world (where confusing interfaces seem to be the norm), Pixel makes sense, but I cannot see how it will appeal to most Mac users, despite the packed feature set. For instance, I was able to set some type, but for the life of me I could not figure out how to select that text again to change its color or size. Pixel was also horribly slow, even on my 3GB Mac Pro with nothing else running. Pixel costs $38 right now, but they plan on raising the price to $89 with the release of Version 2.0 (at some undetermined future date), a comical amount of money considering my limited experience. I hate to tell you to shy away from Pixel, but unless you’re trying to find a low-cost replacement for Photoshop and have a lot of time on your hands, it’s hard to see how Pixel could fit in for you. In my next post, I’ll take a look at the image editor that impressed me the most, as well as a few other specialty applications for those of you who want to work with your images in a simple, specific and affordable manner.